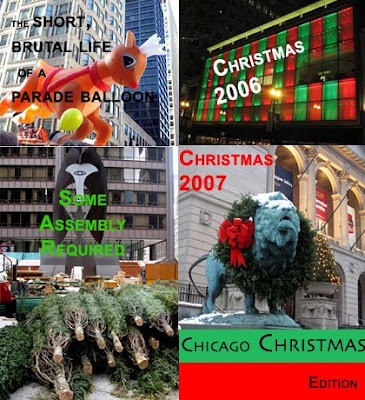 Even though the month shuts down after the 18th, the December Architecture in Chicago calendar is still as overstuffed as the bottom of Warren Buffet's Christmas tree, with over three dozen great events. 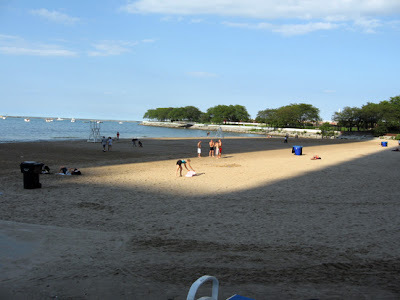 Check it out NOW because its really front-loaded, with nearly half the events taking place this week, including a scheduling log-jam on Wednesday the 3rd where Friends of Downtown annual meeting (a symposium on the Burnham Plan and Chicago's future with Dennis McClendon, Ald. Brendan Reilly, Frank Beal of Chicago Metropolis 2020 and Peter Kindel), Iker Gil talking about new social housing in Madrid (sold out), a doll house viewing and lectures by Bill Tyre and Sally Sexton Kalmbach at the Glessner and Clarke Houses (if you think it's just for sissies, you haven't heard about the minature rooms of Frances Glessner Lee's Nutshell Studies of Unexplained Death) and an overview of the new Lurie's Children Hospital now rising on east Chicago avenue - all going on at the same time. Things kick off this Tuesday the 2nd, ending that evening with Pecha Kucha, vol. 7 - now in 3D! - at Martyr's. Also on Wednesday, Jay Pridmore lectures on his great new book, Shanghai: The Architecture of China's Great Urban Center at lunchtime at CAF. On Thursday, Newberry Library offers a lecture and book signing by Ann Durkin Keating on her new volume, Chicago Neighborhoods and Suburbs: A Historical Guide. Late in the month, there's also programs on 300 N. LaSalle, the Lake Calumet region, Lisa DiChiera discussing the preservation battle at Great Lakes Naval, a film on John Holabird, and lectures and book signings for Eric Bronsky and Neal Samor's The Rise of The Magnificent Mile, and Edward Keegan's Chicago Architecture: 1885 to Today, both at CAF. 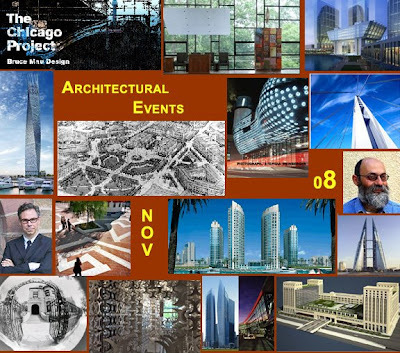 Joe Rosa closes out the month on the 18th as he previews the Art Institute's upcoming Bertrand Goldberg retrospective with a Landmarks Illinois Preservation Snapshots lecture, Are We Ready to Landmark Goldberg Buildings?, at the Chicago Cultural Center. And for holidays, the Glessner House Museum offers up it's annual weekend of candlelight tours, craft bazaars, and sleigh rides for the kids Saturday and Sunday, the 13th and 14th, and the Gene Siskel Film Theater is showing what has become its own holiday perennial, Hiroshi Teshigahara's documentary Antonio Gaudi, the week of the 12th. And believe it or not, there's a lot more. Check it all out - including all the links I'm too lazy to incorporate into this post - here. 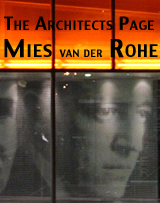 It's said that Mies van der Rohe had simply turned away when someone attempted to introduce him to Jørn Utzon, the Danish architect who in 1957, appearing seemingly out of nowhere, had just won the competition to design a new opera house for Sydney, Australia. Rudeness aside, the reaction was understandable. Not only was Utzon's visionary design a negation of Mies's entire aesthetic of design, but on the cusp of Mie's ideas gaining dominance over modern design (the Seagram Building wouldn't be completed until the following year), Utzon's spectacular liberation from Cartesian linearity was already indicating a means of escape. It may have taken decades for that escape to take hold, past the long dead-end of Post-Modernism, down to today's world of Gehry, Hadid, Koolhaas and Nouvel, but the writing was already on wall, in that preliminary sketch of a profile not flat, setback or ponderous, but a series of soaring, sail-like shells, inspired by the peeling of an orange, that if put back together would have formed a perfect sphere. Cost overruns and government bureaucrats whose highest priority was deflecting blame (remember Richard M. Daley trying to deflect responsibility for all the cost overruns at Millennium Park on the Frank Gehry design which the mayor would so seamlessly reposition himself to embrace once the park opened in triumph? ), resulted in Utzon leaving Australia and his dream project behind. His intentions for the interiors were severely altered by others, and of course when the result - and acoustics - were deemed a failure, Utzon, now conveniently in absentia, was the fall guy of choice. 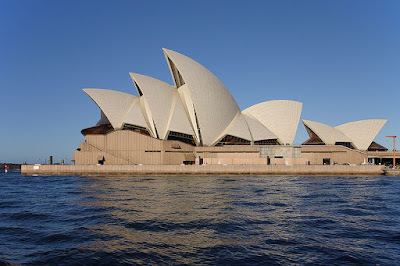 In 1973, the Opera House, the new symbol of the city at the entry of its harbor, also opened in triumph, dedicated by Queen Elizabeth, to the thrilled approbation of huge crowds. Utzon had not been invited, nor was his name mentioned. It was not until a quarter century later that officials began consulting him on bringing the building closer to his original vision. Utzon never went back, never saw first-hand the wonder he had created. In some ways, it's a bitter tale, but the one central, enduring truth is that Jørn Utzon created one of the most path breaking and inspiring structures in the history of architecture. The politicians who fought him fade fast in memory on their descent into oblivion; the Sydney Opera House designed by Jørn Utzon, who died today at age 90, as much as is possible with any work of man, is immortal. OK, so actually they're two different programs, but what they have in common is that they're both on Ovation TV, the arts-oriented cable channel. Earlier this month, Ovation's series Visions of Space featured art critic Robert Hughes looking at the life and work of Mies van der Rohe, Antonio Gaudi, and Albert Speer. On December 7th (10:30 P.M., CST) and 8th (1:30 A.M.), Ovation's Designer People series will present a profile of Ole Scheeren, the brash major domo architect behind Rem Koolhaas's iconic twisting CCTV tower in Beijing. 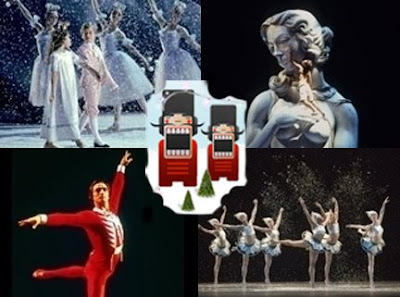 This coming Sunday, November 30th, marks the return of Ovation's Nutcracker Death Grudge Match, hosted by the great Mark Morris, which will present, one a night, six different choreographer's productions of Tchaikovsky's perennial holiday classic ballet. Kicking off the competition will be last year's champ, Morris's own The Hard Nut, which places E.T.A. Hoffman's tale in 60's suburbia. Among the other combatants are George Balanchine, Matthew Bourne, the Bolshoi's Yuri Grigorovich, the Pacific Northwest Ballet with sets and costumes by Maurice Sendak, and Maurice Bejart. You can preview each work and see each choreographer's take on the Dance of the Sugar Plum Fairy, including Bejart's elegant black-tie version shown below, here. Through December 19th, you can vote for your own favorite. The winner will be broadcast Christmas Eve at 7 P.M., CST, with a Christmas Day marathon reprising all six. And if you have time before work (7:00 A.M. CST), or at your desk (10:00 A.M.) on Tuesday, December 2nd, you can catch Knowledge is the Beginning, a documentary on Daniel Barenboim's West-Eastern Divan Orchestra, which brings together young musicians both Arab and Israeli to play and perform together in a culture whose primal impulse is to keep them rigidly segregated. It all makes me consider prying open my wallet and going beyond basic cable. 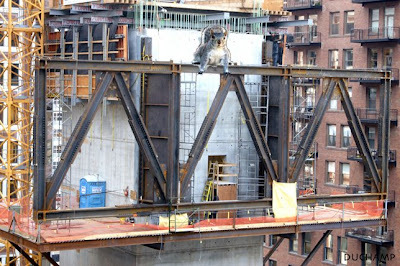 Our indefatigable correspondent - and photographer - Bob Johnson - directed our attention to what's going on at the 215 West Washington, where some engineering gymnastics are going on with the mounting of the huge truss, pictured here, high up on the structure's central concrete core. It was just this past May that Mayor Daley helped break ground for the Jupiter Realty project, designed by Solomon Cordwell Buenz. 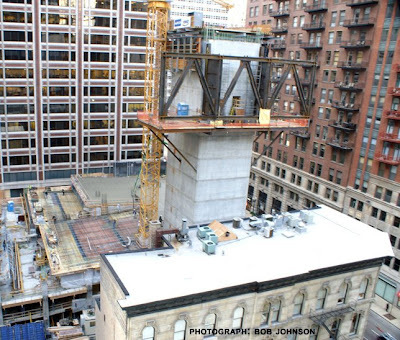 With an estimated cost of $157,000,000 - $16,000,000 in land costs, alone - Medill's Brittany McHenry reports that it will be the first new rental tower in the Loop in 15 years, leading the mayor to enthuse, "This project will not only stand in the history of Chicago, but I believe in this country and the world." 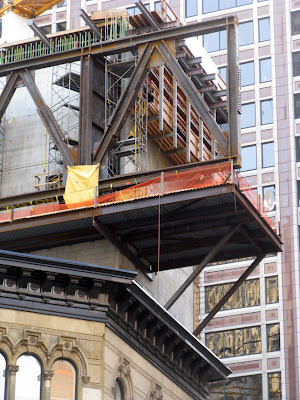 According to Chicago Shawn on Skyscraper City, the design continues to evolve, and the cantilever truss now seen to the east of the core may remain exposed. 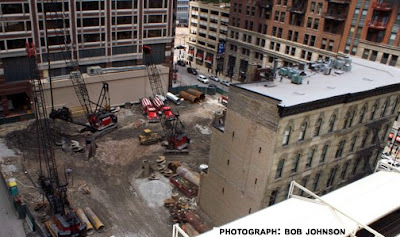 The site wraps around - and dwarfs - the landmark 1873 Washington Block, itself at the time of its construction one of the city's tallest and most elegant buildings. Until a 2005 demolition, 215 West Washington was the address of Holabird and Roches's 1920's Hotel LaSalle Garage, among Chicago's earliest parking garages, concealed behind a terra cotta facade that gave the appearance of being that of a contemporary office building. 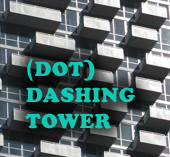 The new 215 W. Washington doubles the LaSalle's six floors of parking. 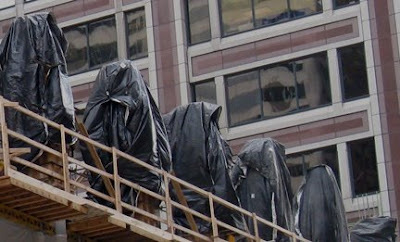 The 50 story building will offer up nearly 400 rental units and is slated to come on line spring of 2010, by which time it is hoped the potential renters you see being kept under wraps below will again have money. Only through Friday to see Boom Towns! Friday afternoon will be your last chance to take in Boom Towns!. Chicago Architects Design New Worlds, the exhibition I guest curated at the Chicago Architecture Foundation, 224 South Michigan. It compares projects of Chicago architects in today's booms towns in the Middle East and China with counterparts in Chicago's own era as a boom town in the 19th century. 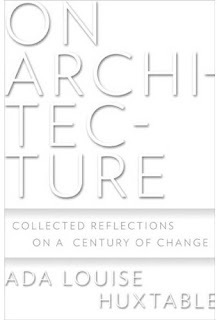 Despite my own participation, it turned out to be a compelling and entertaining show, with great stories, models, and a lot of striking period and contemporary images of some of the most iconic architectural projects of the last century and a quarter. You can read more about the exhibition in my previous post here. And don't forgot to check out Iker Gil's great exhibition Shanghai Transforming, in CAF's John Buck Gallery, where it runs through January 9. Ok, it's cold, damp, and deteriorating. I don't like where this is heading. What better time to contemplate not just the challenges, but the more inviting - and warmer - natures of our waterfronts? Urban Waterfronts 26th Annual Conference 2008 is a three-day event that begins Thursday evening, November 20th, and continues through Saturday. The conference will be book-ended by an open plenary address by Sadhu Johnston, chief environmental officer of the City of Chicago, and a closing address by Gerald W. Adelmann, executive director of Openlands. In between, there's a generous array of panels on such topics as the effect of global warming on coastal cities, waterfront transformations, signature bridges, the preservation and re-use of historic waterfront architecture, and many more. The wide roster of participants includes Elgin mayor Ed Schock, Biloxi mayor Gerald Blessey and Riek Bakker (not the make-up artist, but the architect), from Rotterdam. A champagne reception and gala dinner will recognize the 22nd Excellence on the Waterfront Honor Award winners. You can find program and registration information for the conference here. And if you just can't get enough of awards, there's the rather curious rolling series of them being passed out as freely as party favors this Thursday to Saturday by a group called the Environmental Hall of Fame, inducting into multitudinous repositories of honor national, state, and city, animal, vegetable and mineral. With no fewer than 36 "honorees", there's something for just about everyone, including the Chicago Park District, the Chicago Public Schools, the CTA, Kimpton Hotels, Pat Quinn, Whole Foods, the Merchandise Mart and Pierce and Keely Shaye Brosnan. (I think I may also have seen Svengoolie on the list, for his heroic recycling of rubber chickens, but I could be mistaken.) Who knows? Maybe if you show up at one of the receptions at the Hotel Allegro, "rated the Greenest Hotel in Chicago," you'll get an award, too. Info here. But, of course, historic architecture has two great enemies. One is prosperity, where a historic building is the obstacle to recycling the site to higher density and greater economic gain. The second, however, is poverty, where historic buildings are considered expendable because they no longer seem to possess any residual economic potential. Among the structures mentioned by Ouroussoff is Burnham's 1896, $3,5000,000 Ellicott Square Building. At ten stories high and half a million square feet, it was the largest office building in the world at the time of its opening. Like Union Station in Chicago, it was designed to support an additional 10 floors, but, also like Union station, the addition was never built. Ellicott Square is the product of Burnham's chief designer Charles Atwood, who was said to be able, at a moment's notice, to create a building derived from any historical style you might fancy. Here, he seems to be channeling Adler & Sullivan's Auditorium Building, sans tower or theater, with a base by way of William LeBaron Jenney and a pasted-on grand entrance that's a Rapp and Rapp-like reimagining of Renaissance Italy. 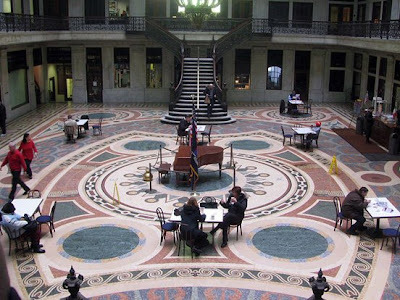 The glory of Ellicott Square is its light-filled central court (the photos here are via TonyTheTiger at Wikipedia), with a brilliant mosaic floor made up of over 23,000,000 tiles. The web version of Ouroussoff's piece beats out the print with an expanded slide show of photos. 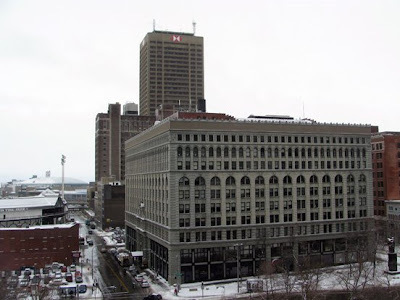 You can see more of Ellicott Square, including a sequence of construction photographs, on the Buffalo as an Architectural Museum website, a wonderful compendium of information and images. 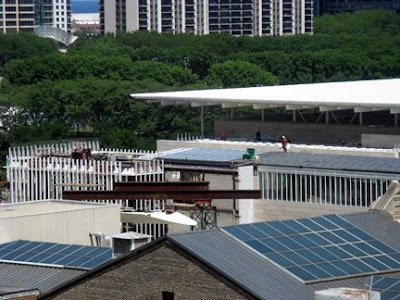 Closer to home, the Trib's Blair Kamin takes an early tour of Renzo Piano's Modern Wing of the Art Institute of Chicago, considering the tensions that arise between museum architecture and the art it was designed to display. 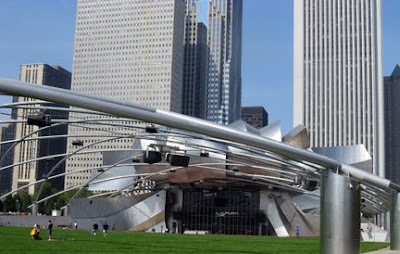 Modern Wing galleries with northern exposures have to compete with the spectacular tableau, flooding through Piano's wall-to-wall, floor-to-ceiling windows, of Millennium Park, centered by the billowing metallic scallops of Frank Gehry's Pritzker Pavilion backdropped by the east Randolph Street skyline. The Art Institute's solution? Put a wall in front of part of the window both to display art and break up the view. It will be interesting to see how the art, itself, will fare in galleries with such large windows. Kamin, who has a Pulitzer, gets to contemplate it now, while I, a mere blogger, will wait for the public opening next Spring. As with Ourousoff, Kamin's piece is actually better in the web version, where it is accompanied by a short video where several Art Institute curators show off the wonders of their new baby. 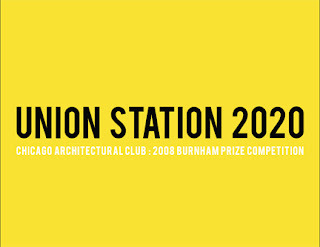 The big news over the weekend was the announcement of the winner of the Chicago Architectural Club's 2008 Burnham Prize competition, Union Station 2020: A Crossroads for the High Speed Rail City, which solicited ideas of how architecture can support the creation of an inter-city high-speed rail network in the greater Chicago area. The first prize team of Michael Cady, Elba Gil, David Lillie, and Andres Montana, which Blair Kamin reports is made up of employees of the Chicago office of Thompson Ventulett Stainback & Associates ,will receive $10,000 for their proposal for a modern reimagining of the lost great concourse of Union Station which would link the high-speed trains to water taxi's along the Chicago river - and require the demolition of the 35-story 222 S. Riverside currently on the site. 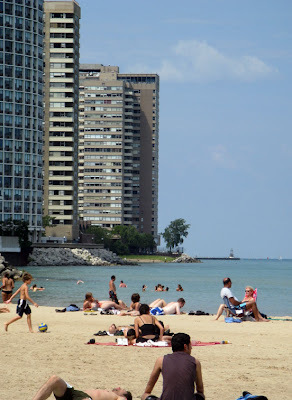 You can see a rendering of the proposal on this post on Blair Kamin's Skyline blog. A selection from the over 75 entries to the competition are on display at the Chicago History Museum as part of the exhibition, Burnham 2:0: A Patchwork Plan for the High-Speed Rail City, which runs through next April 26th. (Find it in KMPG Snyder gallery - enter the Chicago: Crossroads of the America Exhibition on the 2nd floor, head past the "L" car, find the Pioneer locomotive and hang left.) I had a chance to visit the exhibition this weekend, and I'll be writing more about it soon. The CAC is promising it will post images of the competition winners to its website. Let's hope they'll be of the entire entry board, that they won't be pdf's, and that they'll be legible. It often seems as if posting competition boards to the web in a complete and readable form is considered an insurmountable challenge, but lest anyone think it's rocket science, check out the winners page of the Lifecycle Building Challenge competition website. It's not perfect - one of the jpg's is actually almost 6MB (!) - but you'll find a fully readable, zoomable jpg of the board for every winning entry. 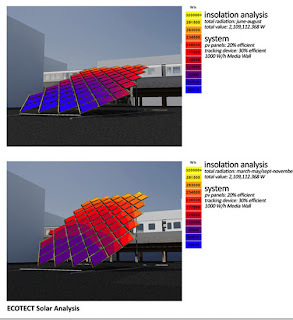 tran/spot: Transient Awareness Center, a proposal created out of the HOK Intern Program at UIC with the participation of students from Washington University, the HSD, Kansas State and IIT's Chris Housley, won recognition in the Student/Innovation category. The focus of the exhibition, sponsored by the U.S. EPA, was on ideas to reduce the huge amount of waste materials created by traditional construction processes, a major environmental goal. 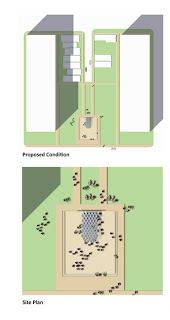 tran/spot proposes "a modular structure that is assembled in empty lots to provide information to the local residents . . . but always returning downtown to represent the neighborhoods it has visited in its travels." The intial circuit for the structure would be from Pilsen, to Wicker Park, and back to Pritzker Park, that abject, (oxymoron alert) gated open space across from the Harold Washington Library at State and Van Buren. At each location the structure would connect to a CTA line - Pink, Blue, and, at the Library Stop, Motley - and center a small plaza that would be "gathering area for movies, presentations, lectures, rallies, protects, or anything else the community requires or desires" and would "allow blighted neighborhoods access to vital information that in the past hindered their opportunities and involvement." 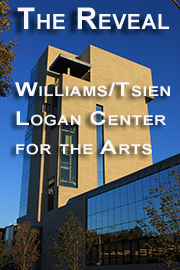 The side of the structure away from the "L" would function "as a community display board, or learning center (exhibiting) job openings, events, community news and other information." 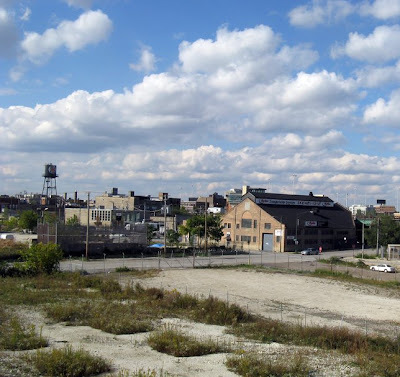 Just as the structure when returned to the Loop would retain memories of the neighborhoods where it had journeyed, the foundation for the structure and, it is hoped, a continuing gathering place for community cultural exchange, would remain at each locale . You can see the entire winning board here. He thinks development is planning . . .
Everything in this city is totally developer driven. You do not get Rockefeller Center-type development unless you have some kind of leadership that will commit to it." Of Mayor Michael Bloomberg's role in the process: "he thinks development is planning." Sound like any other big-city mayor we all know? 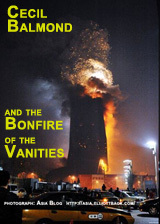 O beautiful age of illusion and utopias! We believe, we hope, and everything seems possible! Apologies to my reader Stephen who commented, regarding my own modest acknowledgement of Barack Obama's stunning victory, " it would've been nice if it could've been a respite from political oriented material," but in light of the such a momentous event, blogs as disparate as Opera Chic, Andrew Patner's The View from Here, and Lee Bey's The Urban Observer all felt compelled to add their own take on the event. For die-hard Republicans, it may have been only politics, but for the rest of us, it was like the scene in Beethoven's Fidelio where the prisoners are finally liberated out of their dungeon into the bright sunlight and clean air. After eight dark years in which our public treasuries were plundered, our reputation trashed, our friends repulsed and our Constitution defiled, last Tuesday's election finally gave us at a least a moment to hope that our better days may still be ahead of us. When I titled my own modest post Now Comes the Hard Part it was in full recognition of the fact that translating that hope into a new, better reality will be a Herculean task. 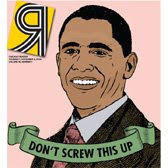 Last week the Chicago Reader took a lot of flak from Afro-Americans and others offended by its cover portrait of Obama with a bottom banner reading "Don't Screw This Up." 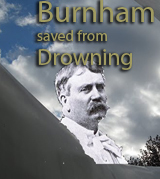 (The alternative cover, which would have run if John McCain had won, was even funnier: "Please Don't Die.") The misconception is that the cover was degrading Obama's ability, which couldn't be farther from the truth. It's a recognition of the enormous and perilous task, greater than that facing any incoming U.S. leader since FDR took office in the depth of the Great Depression, facing our new President. There are 208 newspaper front pages from around the world that we have gathered here so that our visitors can see the beauty in the formats. What talent of those who with only one word, with just the name or a simple phrase, shape their respective newspapers with this story that occupied the front page of many dailies throughout the world. But for one day, at least, we put that aside. 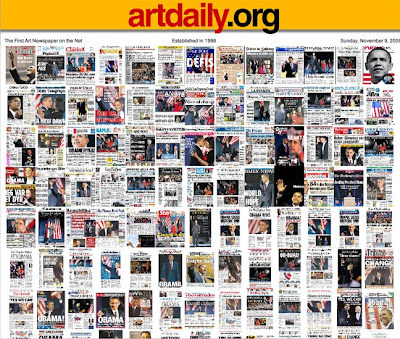 Thanks to artdaily.org, we have their exhilarating portrait both of the audacity of hope, and a reminder of the delight and democracy that was the daily newspaper. Friday, November 7th is the last day to register for New Ways to Inhabit the City, a series of five events co-sponsored by UIC and the Instituto Cervantes. The series kicks off with Stan Allen's 6:00 P.M. lecture on Monday the 10th, and continues on Tuesday, November 11th, with two panels, one at 3:30 - 5:00 P.M., moderated Robert Somol, where Dana Cuff, Clare Lyster, Sam Jacob, and Alexander Lehnerer will discuss Urban Economies, and the second, a panel, Urban Environments, from 5:30 - 7:00 P.M. with Allen, Sarah Dunn, Xavier Vendrell, and Juan Manual Rois, moderated by Penelope Dean. Wednesday the 12th see's a 1 P.M. lecture by Vendrell, Before Landscape Urbanism, and on Friday the 14th at 1:00 Jose Antonio Acebillo will discuss present a lecture titled Urban Turn. 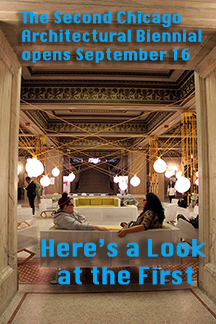 All events will be at Gallery 1100 in the UIC's Art and Architecture Building, 845 W. Harrison. RSVP by calling 312/996.3335 or via email. Information on-line. 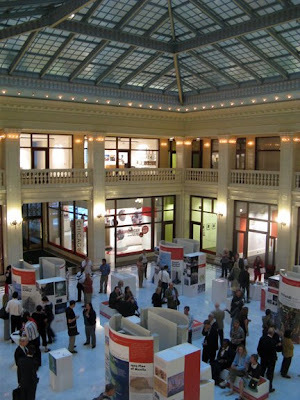 Big Thinkers (patent pending) is one of the key themes of this year's Chicago Humanities Festival, and it's resulted in a series of programs to "celebrate architects, designers, and Big Thinkers (patent pending) throughout history and into the 21st century." 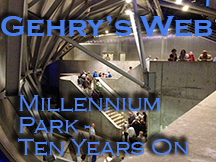 We wrote yesterday about this past weekend's programs, but if you missed them, there are several more next weekend. 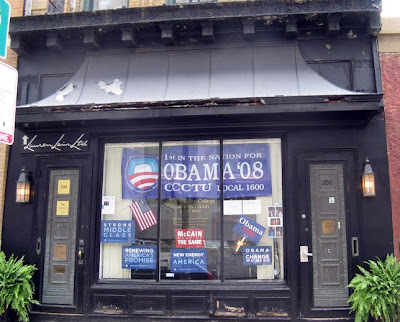 Among them are Offshoring Audacity, and the opening on a new exhibition, Burnham 2.0, at the Chicago History Museum, both on Saturday, and on Sunday, Bruce Mau and Elva Rubio's The Chicago Project. It's just part of a rich array of 50+ different programs on the November calendar that will also include a three-day conference, The Second Wave of Modernism in Landscape Design in America, Structural Engineers Association of Illinois' Evolution of Bridge Technology, and the Council on Tall Buildings and Urban Habitat's annual wards dinner. Friends of Downtown sponsors a look at the redevelopment of the Old Post Office with an expressway running through it, closed and empty since 1996. Carolyn Armenta Davis discusses 21st Century Designs from Black Diaspora Architects at CAF, which is also sponsoring tours of the Goettsch Partners and SOM offices on separate dates. AIA/Chicago offers a tour of Carol Ross Barney's office. There's a walking tour of the Cecil Balmond Graham Foundation exhibition, Solid Void, by IIT's Eric Ellingsen and Director/Curator Sarah Herda. 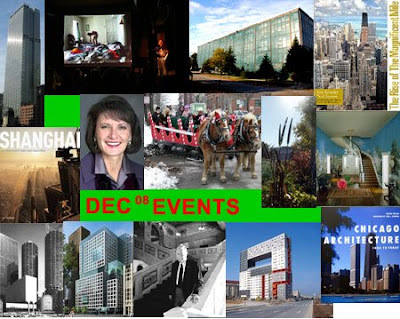 There are lectures by Vince Michael on preservation in China at CAF, William Tyre on Prairie Avenue at the Cultural Center for Landmarks Illinois, Peter Pran and Christoff and Finio at IIT, and Stan Allen, Interloop Architecture's Finley and Wamble, and Realtities: United's Jan and Tim Edler at UIC, and much, much more, including the last chance this Friday to be dazed and confused by my gallery talk for the exhibition, Boom Towns!, at CAF. With the economy continuing to tank, you have to wonder if all these institutions will be able to continue their programs at the current pace, so gather ye rosebuds while ye may, and check the more than half a hundred great November events here. We'll have a larger blurb later, but the November calendar, with over 50 architecture-related events, is up, and it's pretty heavily front-loaded with items, included a number of Chicago Humanities Festival events this weekend and next. Several are already sold out, but today, Sunday, November 2 at noon, there's a panel at the Harris Theatre, The Plan Of Chicago: 100 Years of City-Building, with Carl Smith, Paul O'Connor, Gerald Adelmann and Jeanne Gang, moderated by Lee Bey. At 2:30 P.M. - same location, there's another panel, The Global City of the Future, with Saskia Sassen, Richard Burdett, and SOM's Phil Enquist, moderated by Adele Simmons, vice-chair of the Burnham Plan Centennial Committee. 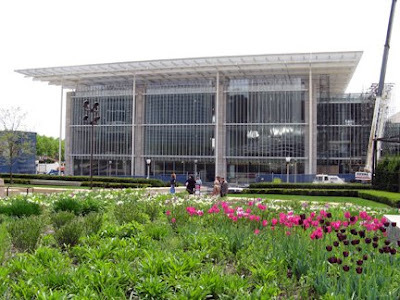 Next Saturday, it's The GO TO 2040 Plan: Bold Innovations for a Better Chicago, 10:00 A.M., and at 2:30, Offshoring Audacity, with Joseph Grima, Jeffrey Inaba, Sam Jacob and Geoff Manaugh, both at the Chicago History Museum. Sunday at Noon at DePaul's Merle Reskin Theatre, Bruce Mau and Elva Rubio: Designing Chicago's Next Century will present the project they've created with SAIC and UIC students to "radically re-envision the future of Chicago's built environment: a Burnham plan for the next century." Tickets at the door are $10.00. Preview all the goodies on the November calendar here. At 2:40 P.M., Friday afternoon, the heart of Chicago stopped beating. Disk jockey, rabble-rouser, raconteur, actor, interviewer, historian, mensch, Louis "Studs" Terkel managed to be a cast of thousands while somehow always remaining true to himself. I'm sure he found no small irony in the fact that the cavalcade of his life stretched from one Great Depression to another. He had seen it all, but he never lost his sense of wonder. He knew where he stood, but he never demonized his enemies. Early in his career, Studs spun records for a show he called The Wax Museum. I doubt many young people today would get the joke, but it's funny how things turn on themselves. 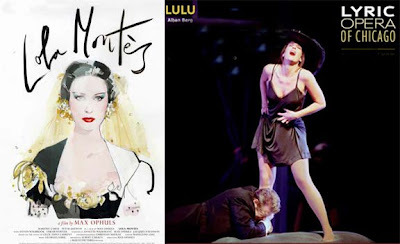 We've gone from the era of 78 rpm records that held 3 minutes of music - great for songs, but requiring a stack the size of a Great Dane for a complete opera - to the era of the iPod, where you buy an opera an aria at a time. Studs was the ultimate elitist-egalitarian. His tastes ranged from pop, to jazz, to blues, to opera. He believed what Arnold Schoenberg told a George Gershwin suffering from an inferiority complex over his tin pan alley origins. "There are only two kinds of music," said Schoenberg, "bad music and good music." As I write this, the usual mixmaster traversal of my iPod library is playing through my headphones, so I thought I'd pay tribute to Studs with a selection from my own mini Waxless (other than ear wax, of course) Museum. I. The beginning of Prokoviev's Lt. Kije, a sleepy, plaintiff morning song on a trumpet, then a snare drum, revving up, a piccolo chirping, then a flute, horns giving the parade an oomph, more woodwinds, then the strings setting the horns speeding up, chased by trombones, and finally a huge bass drum gleefully being whacked hard enough to set a building shaking, an entire village waking up and bursting with the sheer physical joy of being alive. 2. Io so che alle sue penne non ci sono conforti! sings Pinkerton, I know there is no consolation for her grief. He has come back to Japan, after three years absence, with Kate, his American bride, to reclaim the child he fathered with Madame Butterfly. Pinkerton, the American Consul Sharpless, and Butterfly's servant Suzuki - they all know that the situation is cruel and unjust, but as Jean Renoir once noted, "Everyone has their reasons" and in a trio of heartbreaking beauty they pour out their pain even as they blindly push the story forward to Butterfly's tragic end. I hate a song that makes you think that you are not any good. I hate a song that makes you think that you are just born to lose, bound to lose. No good to nobody. No good for nothing. Because you are too old or too young or too fat or too slim too ugly or too this or too that. Songs that run you down or poke fun at you on account of your bad luck or hard traveling. I am out to FIGHT those songs to my very last breath of air and my last drop of blood. I am out to sing songs that will prove to you that this is YOUR world and that if it has hit you pretty hard and knocked you for a dozen loops, no matter what color, what size you are, how you are built, I am out to sing the songs that make you take pride in yourself and in your work. 4. You could say there's a born-to-lose element in the last symphony Gustav Mahler would live to complete, his Ninth, whose four movements Leonard Bernstein heard as a series of farewells. At the end, the music breaks up into melodic fragments that finally just die away. That's how it's usually heard. That's how I always heard it, until a performance, a few years ago, by Seiji Ozawa conducting the Saito Kinen orchestra, a good, maybe not great performance, until those final pages, when something extraordinary happened. At some point, I began to hear what was in the hall between those diminishing phrases, not as silence, but as something palpable, like the way a perfume keeps the presence of a woman in a room she has just left. As the music ended, you could feel the audience, as one, holding its breath, not stirring, not moving, not doing anything that would break the stillness that somehow allowed to us share a profound presence, beyond words or sound, that the normal commerce of our lives kept us from sensing. 2,600 people. No one wanted to let it go. Then, after a time, someone started to applaud, and, in an instant, it vanished. Except, indelibly, in our memories. So long, Studs, it's been good to know ya . . .